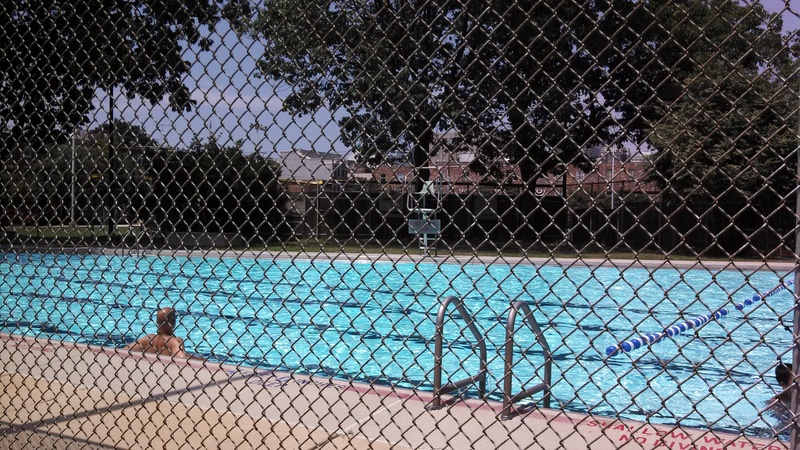 The University City Swim Club, near 48th and Spruce in West Philadelphia, is a private membership club with four swimming pools that stay open 10am-10pm from late May to early September. There is a waiting list to pay $2000 (plus annual dues of $600+) to join. The first time I heard of the UCSC was about ten years ago when my friend Desi was working as a nanny for a family with a membership. I remember her telling me one day that she and the little girl she cared for were headed to the pool when they passed some other kids playing on the street. “You going swimming?” the kids asked them. “Yep,” they replied. “Wish we could go swimming,” the kids said, shuffling their feet and looking down at the hot sidewalk. 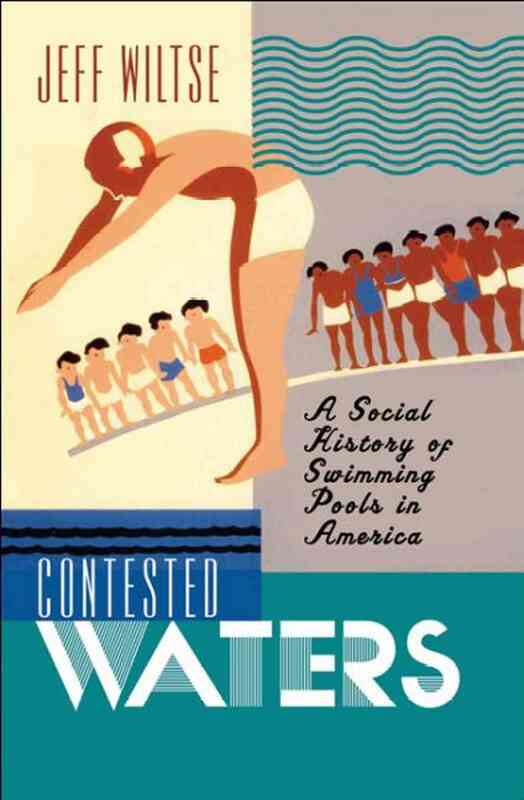 With that as my primary association with the place, I was interested to hear that when the UCSC opened in 1964, at a time when nearly all public and private pools were racially segregated, it did so as an intentionally racially integrated swimming pool. One of the guests on the show, Dr. Lynda Murray Jackson, a member since the UCSC opened, spoke glowingly of the familial atmosphere and joy of swimming there, and callers echoed her sentiments. (As did a caller from Yeadon’s Nile Swim Club, an historically African American swimming pool that opened in 1959 a few miles away.) And while many water-lovers would probably profess similarly fond memories of their childhood swims, having a racially integrated swimming pool in 1964 was in fact a very, very special thing. Poor and working-class Americans suffered most directly from the privatizing of swimming pools. When middle-class Americans abandoned municipal pools in favor of private pools, cities downgraded the public importance of swimming pools. They built relatively few new pools, neglected maintenance on existing pools, and eventually closed dilapidated pools rather than pay for costly repairs. As a result, those Americans who could not afford to join a swim club or install a backyard pool had less access to swimming and recreation facilities than did previous generations. By the end of the twentieth century, many poor and working-class neighborhoods in American cities lacked appealing public spaces where residents could gather to socialize, exercise, relax, play, and forge community bonds. Some of this is and has been true here of course, but the bottom line is that Philadelphia still has 74 public pools! I have swum in nearly half of them and can attest that they are indeed ideal places to socialize, exercise, relax, play, and forge community bonds. 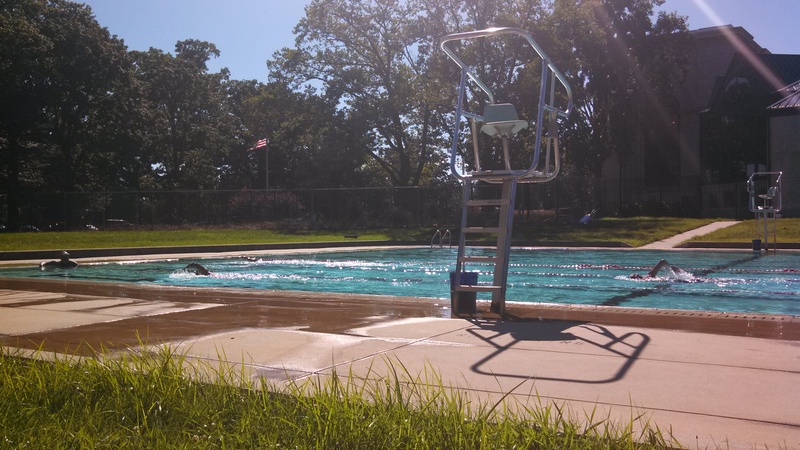 They don’t have the bells and whistles of private swim clubs, the midnight swims and snack bars and special memberships for your family nanny to attend only with member children ($795 this summer at the Lombard Swim Club). But they are equally cool and wet on a hot summer day, and if you live in the city you can probably walk to one from your house. They open (on a staggered schedule) in late June and stay open Monday-Friday 11am-7pm and weekends 12-5pm until late August. Most have free swim lessons for kids, special family swim times, and an adult/lap swim the last hour of every day. They can get crowded for sure, but overall they are underused (in the summer of 1937, Philadelphians swam in our pools 4.3 million times; last summer, we swam 820,012 times). Any concern that they are not clean is completely unfounded and – as Wiltse’s history makes clear – grounded in race and class prejudice. So I say to all my fellow Philadelphians – no matter if you’re languishing on a private swim-club waitlist or standing outside one shuffling your feet and looking down at the hot sidewalk, huddled inside in the air-conditioning or sitting on your stoop trying to catch a breeze – you too can come swimming this summer! I hope you do. 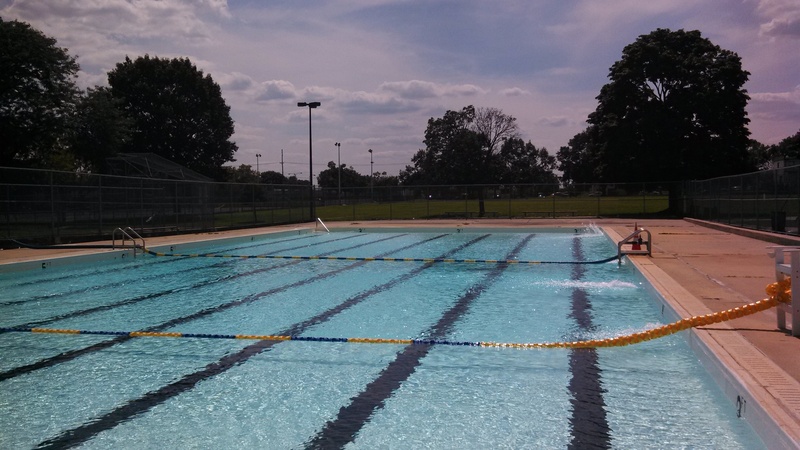 Here’s the Department of Parks & Recreation list of all the pools. Yesterday I went for the drug test that all City of Philadelphia lifeguards must pass to work at our pools. It was at the City health center at 19th and Fairmount and generally the same as last year. Then, having to perform jumping jacks and squats for a doctor while wearing only a paper gown – to make sure I wasn’t concealing any pre-peed, drug-free urine on my person – took me a little aback. But not this year! I chatted with my fellow lifeguards as we waited around in our crepe-paper outfits, picked up some of the City’s handy free condoms while I was there, and after a mere hour and a half was again on my way. Larry and Thelma are training new lifeguards at Sayre-Morris most days of the week. Rec leaders all over town are hounding their pool staff for paperwork (in addition to the drug test, lifeguards need documentation of a doctor’s physical, an FBI clearance and a PA state police background check). And I, for one, am breathlessly awaiting opening day. These events celebrated not just a season’s opening day but the first-ever unveilings of New York’s WPA-funded swimming pools. So priests and circus clowns might be overkill for Philly this June. But neighborhood parades? That’s the least our pools deserve! View of the pool from the bleachers. In my experience, Marian Anderson is consistently the calmest pool in South Philadelphia. So much at the pools can vary from year to year, from day to day, and even from hour to hour. But in the seven years I’ve been visiting Anderson, there has always been space to swim from one end of the pool to the other without bumping into another swimmer. Everyone who swims here showers before entering the pool, because the shower is set up over the pool gate so there’s really no way around it. You need to undress and leave your things on cement bleachers outside the chain-link fence (raised up from and separated from the street by another fence, and clearly visible from the pool). The pool itself is an irregular pentagon shape, with big trees shading the deep end (or deep-er end, at 4 feet 10 inches) and a view of Center City’s buildings beyond. There are lines on the bottom of the pool for lap swimming, and I met a man last summer who was learning how to swim from the “old heads” (his words) who do laps here on weekday afternoons. Originally called McCoach Playground, the rec center bounded by Fitzwater and Catharine Streets to the north and south and 17th and 18th to the east and west was re-dedicated in honor of Marian Anderson in 1954. Anderson, the legendary contralto and trailblazer (among her many accomplishments: being the first African American to sing with New York’s Metropolitan Opera), was born in Philadelphia in 1897 and grew up in this area. The Marian Anderson Historical Society at 762 South Martin Street, in a house where she lived for nearly twenty years, sits a block and a half from the pool. 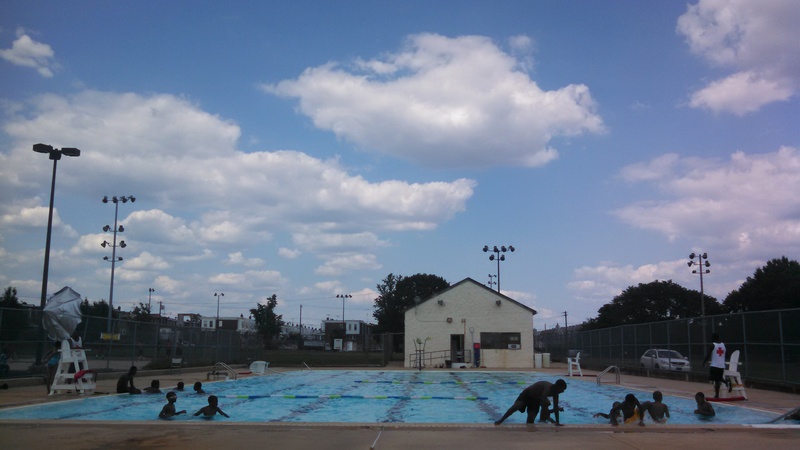 A few days after Anderson’s death in 1993, the Inquirer’s Acel Moore remembered her (and the neighborhood in which they’d both grown up) in a piece that includes this pool history: “The old facility was the only playground in South Philadelphia where black children were welcome, and its outdoor swimming pool was the only place in the city – other than the Christian Street YMCA – that blacks could go swimming, public or private, up until the mid ’50s.” Knowing that, it makes even more sense that this particular pool is named for this great Philadelphian. I was excited to find this book (written by Jeff Wiltse, a history professor at the University of Montana; published by the University of North Carolina Press in 2007) at the Free Library of Philadelphia. In 1898 Boston’s mayor Josiah Quincy sent Daniel Kearns, secretary of the city’s bath commission, to study Philadelphia’s bathing pools. Philadelphia was the most prolific early builder of municipal pools, operating nine at the time. All but three were located in residential slums and, according to Kearns, attracted only “the lower classes or street gamins.” City officials had built the austere pools during the 1880s and 1890s — before the germ theory of disease transmission was popularly accepted — and intended them to provide baths for working-class men and women, who used them on alternating days.The facilities lacked showers, because the pools themselves were the instruments of cleaning. Armed with the relatively new knowledge of the microbe, Kearns was disturbed to see unclean boys plunging into the water: “I must say that some of the street gamins, both white and colored, that I saw, were quite as dirty as it is possible for one to conceive.” While the unclean boys shocked Kearns, blacks and whites swimming together elicited no surprise. He commented extensively on the shared class status of the “street gamins” and their dirtiness but mentioned their racial diversity only in passing. Nor did racial differences seem to matter much to the swimmers, at least not in this social context. The pools were wildly popular. Each one recorded an average of 144,000 swims per summer, or about 1,500 swimmers per day. In the first chapter, Wiltse mentions that one of the first municipal pools in the U.S. was Philadelphia’s “swimming bath,” which opened in June 1884 at 12th and Wharton Streets. I live about fifty feet from that intersection (where, sadly, there is no longer a pool). I cannot wait to read more.